They stay up late into the evening, average less than 6.5 hours of sleep and rarely nap. College students during final exams? Working moms? Hard-charging executives? Think again, says a UCLA-led team of researchers who studied sleeping patterns among traditional peoples whose lifestyles closely resemble those of our evolutionary ancestors. What the team found among the Hadza of Tanzania, the San of Namibia and the Tsimane of Bolivia challenges conventional wisdom about the sleeping habits of pre-industrial humans. The findings, published today in Current Biology, suggest that the industrialized world's sleep habits do not differ much from those that humans evolved to have. "The argument has always been that modern life has reduced our sleep time below the amount our ancestors got, but our data indicates that this is a myth," said Jerome Siegel, leader of the research team and professor of psychiatry at UCLA's Semel Institute of Neuroscience and Human Behavior. "I feel a lot less insecure about my own sleep habits after having found the trends we see here," added lead author Gandhi Yetish, a Ph.D. candidate at the University of New Mexico. The findings do validate some common ideas about sleep and health, including the benefits of morning light, a cool bedroom and a consistent wake-up time. An international authority on sleep, Siegel is a past president of the Sleep Research Society. For 40 years, he has run a basic sleep research lab in Los Angeles. He started studying sleep among traditional peoples two years ago, asking anthropologists who were already heading into field to bring along special watch-sized devices that measure sleeping and waking times as well as light exposure. Researchers from Hunter College, Yale University, UC Santa Barbara and the University of New Mexico clocked sleep patterns among the Hadza, hunter-gatherers who live near the Serengeti National Park, and the Tsimane, hunter-horticulturalists who live along the Andean foothills. 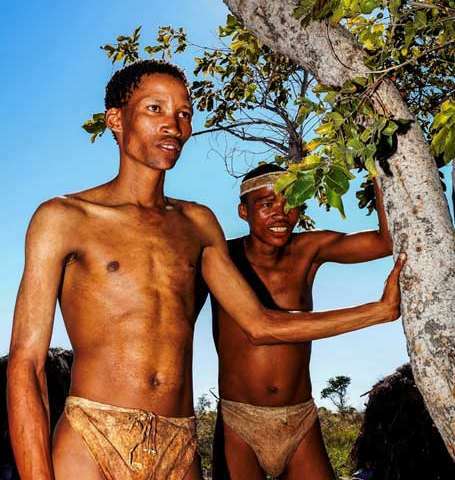 Siegel, aided by contacts supplied through a colleague at Witwatersrand University in South Africa, gathered measurements among the San hunter-gatherers in the Kalahari Desert. In addition to measuring how long and when these adults slept during the summer and winter, Siegel measured their body temperatures, the temperature in their environment and the amount of light to which they were exposed. The team, which received support from UCLA, the National Institute of Health and the National Research Foundation of South Africa, collected sleep records on 94 adults for a total of 1,165 days. The study is the first on the sleep habits of people who maintain foraging and traditional hunting lifestyles in the present day. One myth dispelled by the results is that in earlier eras people went to bed at sundown. The subjects of the study stayed awake an average of 3 hours and 20 minutes after sunset. "The fact that we all stay up hours after sunset is absolutely normal and does not appear to be a new development, although electric lights may have further extended this natural waking period," said Siegel, who is also chief of neurobiology research at the Veteran Affairs of Greater Los Angeles Health Care System. Most of the people studied by Siegel's team slept less than seven hours each night, clocking an average of six hours and 25 minutes. The amount is at the low end of sleep averages documented among adults in industrialized societies in Europe and America. "There's this expectation that we should all be sleeping eight or nine hours a night and that if you took away modern technology people would be sleeping more," said Yetish, who spent 10 months with the Tsimane. "But now for the first time we're showing that's not true." There is no evidence that these sleep patterns took a toll on people's health. In fact, extensive studies have found that these groups have lower levels of obesity, blood pressure and atherosclerosis than people in industrialized societies, and higher levels of physical fitness. The amount they slept varied with the seasons, with the study's subjects averaging six hours in the summer and just under seven hours in the winter. Still, they rarely took naps. "There's this myth that humans used to take daily naps, but that now—because we're so busy and we can't get back to our homes—we suppress the naps," Siegel said. "In fact, napping, is relatively rare in these groups." One recent history suggested that humans evolved to sleep in two shifts, a practice chronicled in early European documents. But the people Siegel's team studied rarely woke for long after going to sleep. Siegel chalks up the discrepancy between his findings and the historical record to a difference in latitudes. The groups of people studied live near the equator, as did our earliest ancestors; by contrast, early Europeans migrated from the equator to latitudes with much longer nights, which may have altered natural sleeping patterns, he said. "Rather than saying modern culture has interfered with the natural sleep period, this is a case in which modern culture, with its electric light and temperature control, was able to restore the natural sleep period, which is a single period in traditional humans today and therefore likely in our evolutionary ancestors as well," Siegel said. Insomnia was so rare among those studied that the San and the Tsimane do not have a word for the disorder, which affects more than 20 percent of Americans. The reason may have to do with sleep temperature. The people studied consistently slept during the nightly period of declining ambient temperature, Siegel found. Invariably, they woke up when temperatures, having fallen all night, hit the lowest point in the 24-hour period. This was the case even when the lowest temperature occurred after daybreak. The pattern resulted in roughly the same wake-up time each morning, a habit long recommended for treating sleep disorders. "In most modern environments, people are sleeping in a fixed temperature, even if it is reduced from daytime levels," Siegel said. "It may well be that falling environmental temperature is integral to sleep control in humans." The team was surprised to find that all three groups receive their maximal light exposure in the morning. This suggests that morning light may have the most important role in regulating mood and the suprachiasmatic nucleus, a group of neurons that serve as the brain's clock. Morning light is uniquely effective in treating depression. "Many of us may be suffering from the disruption of this ancient pattern," Siegel said. This really misses the point, imho. We suffer sleep deprivation in a way pre-industrial humans didn't because we're tied to a clock. You don't need as much if you can do it when you want to and need it. That's why most aboriginals are notoriously un-punctual when dealing with industrial societies. To them the time something happens is when it happens, not conformity to an external device. You can't really be late in their thinking because it doesn't happen until you're there and it happens. Industrialized peoples try to map their internal perceptions to an external clock and that causes sleep problems because our circadian rhythm is not 24 hours. It's more like 25. That's the "circa" in circadian. I see, so primitive cultures stayed active in the dark? We have a hellofa lot more history with no light sources than we do with light, thousands of years worth. I'm guessing during that time they slept at dark and rose at first light. Ridiculous article. They probably use light sources, namely camp fires. It made sense for our ancestors to stay awake for several hours after nightfall (even before we used fire). Most predators hunt at dusk/dawn and have very good night vision. It's not a good survival strategy to be caught sleeping at that time. We suffer sleep deprivation in a way pre-industrial humans didn't because we're tied to a clock. You don't need as much if you can do it when you want to and need it. I suspect these are both important points. Still does not explain why women are so bitchy when they don't get enough sleep.